﻿﻿Treatment for many injuries to the hoof can be aided by the immediate application of a frog support device. Veterinarians and farriers for years have found this first stage treatment to be complimentary to the more extensive treatment that may follow. 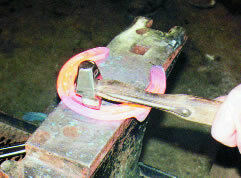 Farriers can train horse owners to apply a simple device such as the Lily Pad that is described in this article. Remember that in many cases time is critical to the success of the overall treatment and immediate attention can often aid in recovery. We’ll mention a few more common injuries that have been helped by immediate use of a frog support device. Any emergency support device should be designed to take the load off the hoof wall or sole and put it on the frog. Remember that this device is only an aid and not a treatment. Consult with your veterinarian if possible before you apply support but certainly as quickly as possible afterwards. Common Injuries and Problems: Sole Bruises, Punctures or Abscesses, Quarter Cracks, Corns, Broken Bars, Sheared Heels, Acute Laminitis. The application of a device like the Lily Pad is simple but requires attention to a few details. Begin by trimming the pad so that the frog piece stops 3/8” back from the point of the freshly trimmed frog. It should also be trimmed on the sides so the sulcus is clear, not covered by the pad. A belt sander is very useful in this fit. 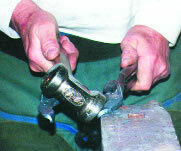 However, it can be trimmed to size with a knife, nippers or shears. The positioning of the pad is the most critical step in the process. As the pictures illustrate, you can hold the pad in place after trimming to size by placing one strip of duct tape around the pad at the heel area (below the bulbs) and forward along the wall on both sides. To make the job easier, don’t place the duct tape strips on one at a time after this positioning. You can put your strips on a flat, clean surface overlapping each until you feel you have enough to cover the bottom of the hoof and overlap so that you can bring the tape up the wall. 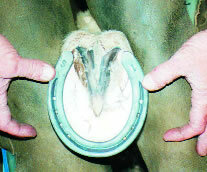 After placing this on the hoof you can wrap around the circumference of the hoof as a final step. This easy frog support application is cost effective. 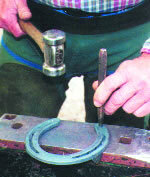 As a farrier you can keep a few pairs of these pads in your inventory at a low cost. You can also encourage your owners to keep at least a pair of pads and a roll of duct tape in their tackroom so that they can apply the device if necessary. ﻿1. Untrimmed pad on foot, pads almost always need trimmed to fit frog. ﻿ 2. Trimmed pad, behind point of frog and not extending out sides of frog. ﻿ 3. First strip of duct tape to hold pad in position. ﻿﻿ 4. You can see the support given by pad. ﻿5. Build your set of strips to hold pad on before going to foot. ﻿ 6. Tape applied to foot. ﻿ 7. Last step, wrapping tape around circumference of wall.